The total tur nover of Thua Thien-Hue tourism sector reached 4.6 billion VND (2.1 million USD) in the first nine months of this year, according to provincial Department of Culture, Sports and Tourism. 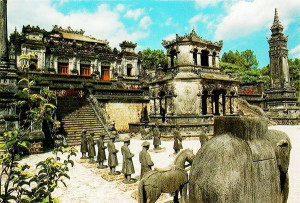 Hue attracted nearly 2 million of tourists including 752,000 foreign arrivals to the ancient capital in the last nine months of this year. The province is very optimistic that it will receive another 500, 000 visits between now and year end as the peak season falls in the last three months of the year. The provincial tourism department has also launched many promotion programmes to lure tourists to Hue in the last three months of this year. Most include discounts on food, hotel rates and discount tickets to royal theater. The reopening of Phu Bay airport will make visitors’ transportation to Hue fast and easy. The revenue tourism services for 2013 is expected to account for 50 percent of provincial GDP.